Western blot analysis of extracts from various cell types using AID (30F12) Rabbit mAb. 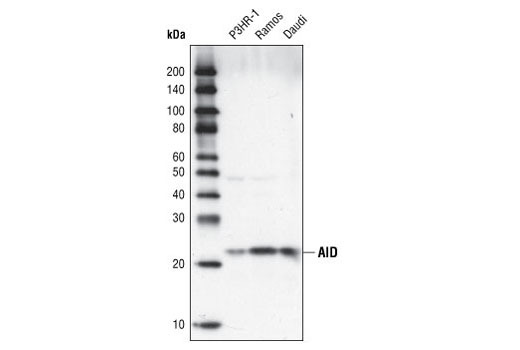 AID (30F12) Rabbit mAb detects endogenous levels of total AID protein. Monoclonal antibody is produced by immunizing animals with a synthetic peptide corresponding to residues surrounding Leu165 of human AID. Activation-induced cytidine deaminase (AID) is thought to modify RNA due to its high homology to the RNA editing enzyme APOBEC-1. This function, however, has not been confirmed in in vitro studies, which show that AID has significant cytidine deaminase activity, and that this activity is blocked by zinc chelation (1). The B cell immune system must specifically recognize several infectious agents, which vastly outnumber immunoglobulin gene segments present in a given organism. Mechanisms such as somatic hypermutation, isotype switch recombination and gene conversion introduce diversity and specificity to the immune system. Analysis of mouse models and patients with AID deficiency has established a link between all three of these mechanisms and AID function (2). AID protein is detected in germinal center centroblast and germinal center derived lymphomas (Burkitt lymphoma), but not in pre-germinal center B cells or post-germinal center neoplasms (B cell chronic lymphocytic leukemia and multiple myeloma) (3). Muramatsu, M. et al. (1999) J. Biol. Chem. 274, 18470-18476. Reynaud, C.A. et al. (2003) Nat. Immunol. 7, 631-638. Pasqualucci, L. et al. (2004) Blood 104, 3318-3325.